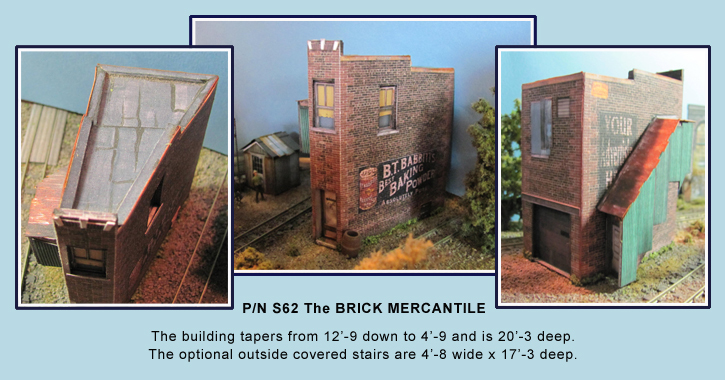 This Brick Version of our Mercantile Building is the same footprint as the clapboard version, kit S13. It has the same roof line and outside, covered stairs. It differs in that it does not have the Timber Loading Dock because of the ground level, rear loading doors. Another great triangular shaped building for those hard to fill spots on the layout. This wooden crossing tower is typical of those found all over from the 30’s to the late 50’s. There are 2 versions included in this kit, an all green one and a white with green trim. This is a tiny building. Not difficult to build, but the stairs require some care in assembly. We have had this kit rattling around in our archives for quite a while and because of some recent interest thought it was about time to release it. Just a simple open sided, wooden shed with a tin roof. Ideal for storing lumber or other bulk material. Also works well on the farm. About 26’ x 20’, a nice simple build with a full interior. Also includes many signs that can be used all over the layout. Just a simple, run down, wooden shed that you can put anywhere on the layout. that needed a bit of protection from the elements. A great first time kit.